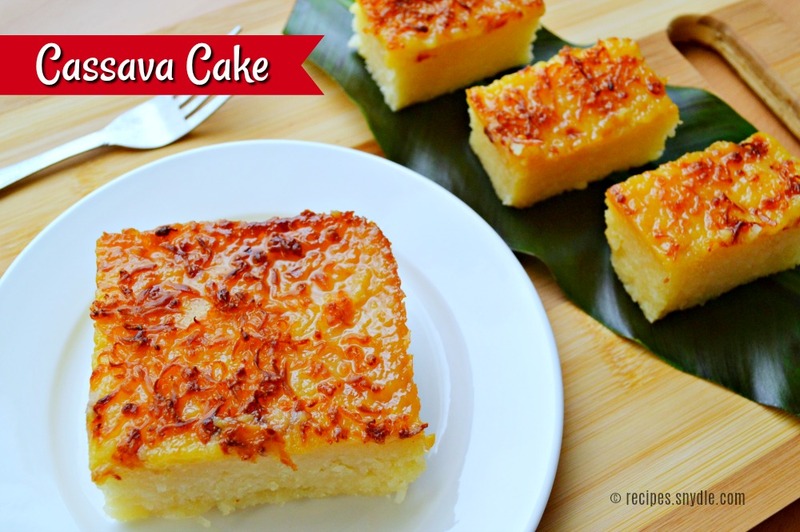 Cassava cake is a yummy, fudgy and flavorful dessert made of grated cassava, coconut milk, eggs and condensed milk. There are so many delicacy and souvenir shops that sell special cassava cake. Ralo’s, Rodilla’s are some of the few. 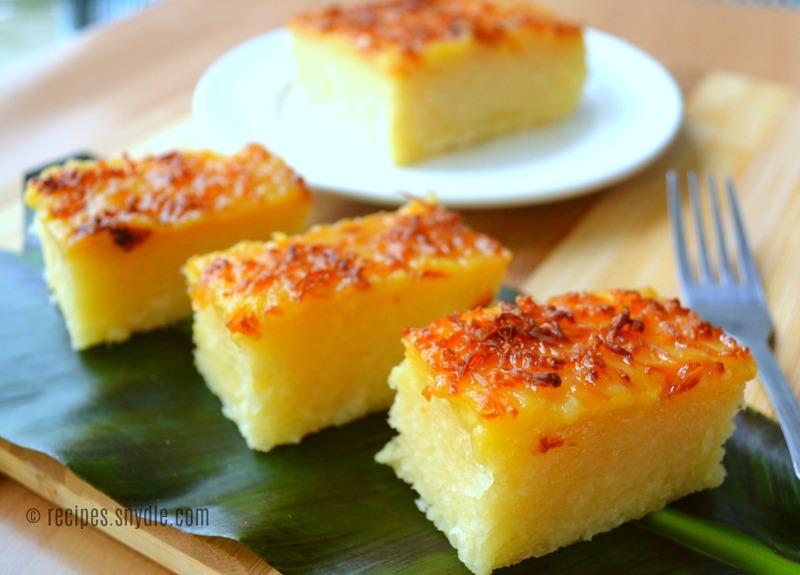 Usually topped with macapuno, custard or grated cheese, Cassava cake is a delectable treat everyone would love. But don’t worry, you can make at the comfort of your home. Cassava, also called tapioca, yucca or manioc (kamoteng kahoy in the Philippines), is a root crop abundant in tropical regions of Asia. But with popularity and vast use of cassava, there are many Asian stores around the world that sell frozen grated cassava. 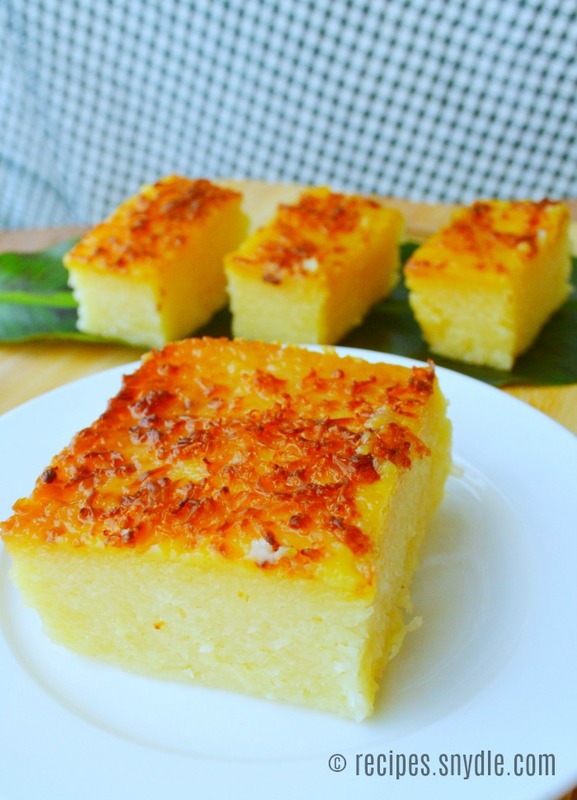 So wherever you are, you can certainly make a special homemade cassava cake. In this recipe, I used fresh cassava. In the Philippines, many people have a few tree of cassava in the backyard. My dad grow some that serve as our fence and he harvested a few roots today. So instead of just boiling or steaming them, I thought of turning it into a delicious treat – CASSAVE CAKE! So let’s start. Mix all the cassava ingredients. In a mixing bowl, combine grated cassava, coconut milk, evaporated milk, condensed milk, melted butter, sugar and egg. Stir and mix well. Grease your baking pan and pour your mixture into it. Bake for 45 minutes to 60 minutes or until the batter tester comes out clean. To make the topping, mix coconut milk, condensed milk, egg yolks in a mixing bowl. Get the cassava from the oven. Then, pour the toppings over your baked cassava. Sprinkle with grated cheese. 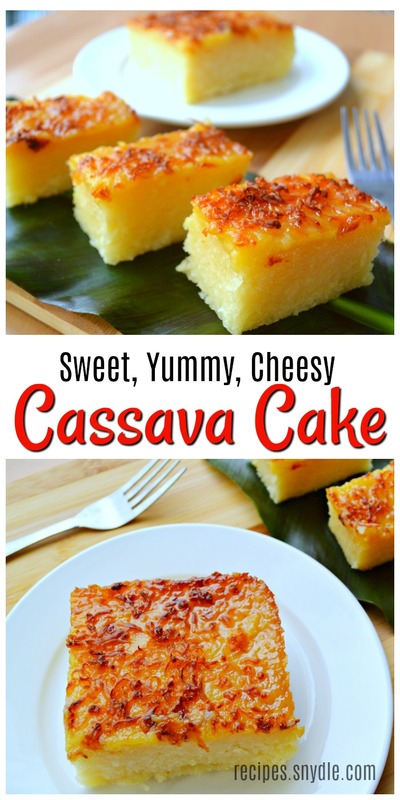 NOTE: Make sure that the cassava is firm and cooked before putting the topping. Grease your baking pan and pour your mixture into it. Bake for 45 minutes to 60 minutes or until the batter tester comes out clean. To make the topping, mix coconut milk, condensed milk, egg yolks in a mixing bowl. Set aside. Broil for 10 minutes or bake for another 15 to 20 minutes. Note: You can also use other toppings like macapuno, jackfruit, custard, or keep it as simple as grated cheese and condensed milk.